Six years ago, around this time, there was a fun discovery. Rafael from LRG found some counterfeit M.U.S.C.L.E. figures at a store in Brazil. The store is an inexpensive store, similar to dollar-stores in the United States. I asked Rafael to go back and document some of his experience. He was cool enough to go back and provided a cool experience for all collectors. 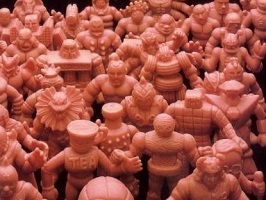 The Uniao Festas figures are a super-fun footnote in M.U.S.C.L.E. history for me. Five years ago, this is all that was posted. Luckily October got a little bit better – but the start was a little rough. As I re-read that I am shocked with how much still applies. I think that time in my life was a watershed moment. I think it helped me be ready for the future. I still miss some of the friends I made. But that is true of all my friends. I am terrible at maintaining relationships. I wish I was better. I try to be better, but it is not one of my strengths. I am glad that the website has changed. It may not seem like it to most people, but dropping the overuse of third-person was critical. Having Professor Terry join me was also a gift. I have had more fun with it. Lastly, I am down to needing 12 figures. When I wrote that other post I was not sure if I wanted to continue. Ultimately my drive was to collect the final figures so I could complete my virtual archive. But I found another way to do it, and it was awesome! Very recently a collector asked me if I was trying to finish my set. I realized the most truthful answer was, “Yes. But I plan on spending $1 per figure.” It would be nice if someday I found those figures, but it does not have any real meaning for me. It is hard for me to rationalize how much I spent, or attempted to spend, on some of those figures. When I think about it I feel genuine shame and embarrassment. The only relief, looking back at that behavior, is that I never acted in a way that should/could bring me shame and embarrassment. My life is not always filled with the ““high road,” so I do cherish the times when I feel like I took it. This entry was posted on Saturday, September 19th, 2015 and is filed under UofM News. You can follow any responses to this entry through RSS 2.0. You can skip to the end and leave a response. Pinging is currently not allowed.